Nearly 6 in 10 Hispanic adults have had a difficult time communicating with a health care provider because of a language or cultural barrier, and when they do they often turn to outside sources for help, according to a new study conducted by The Associated Press-NORC Center for Public Affairs Research. The survey finds that half of those who have faced those barriers turned to a family member or to another health care provider for assistance. 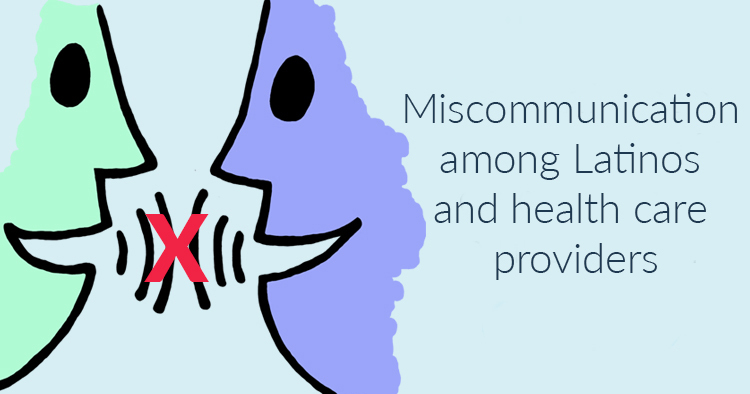 In addition, more than 1 in 4 looked to a translator, public resources in their community or online sources for help when they faced those issues. Antonio Torres, 53, of Orlando, Florida, who is bilingual and legally blind, told The AP he regularly struggles to understand the medical terms used by doctors and nurses. "When I tell them I don't understand them, they'll bring someone over to speak to me in Spanish and I don't understand them, either," said Torres, who is Puerto Rican and was raised in New York. "We didn't grow up speaking that formal Spanish, so I have no idea what they are saying." At times, Torres said he even gets medicine with his name misspelled on the bottle. "And I don't know if I'm taking my medicine or someone else's," he said. The language and cultural barriers in health care for Latinos are something advocates have been pointing out for years. In 2014, for example, the Obama administration faced criticism following the rollout of the Spanish version of the federal health care website, CuidadoDeSalud.gov. The translations were so clunky and full of grammatical mistakes that critics say they must have been computer-generated. The website also translated "premium" into "prima," the Spanish word more commonly used to mean a female cousin among Mexican-Americans and Mexican immigrants. Along with communication challenges, many Hispanics are concerned about language or cultural accommodations for people in their community who seek long-term care services. Fewer than half say it would be easy for older Latinos in their area to find a nursing home or assisted living facility with staff that speaks their language, or to find a home health aide who does. Even fewer — less than 3 in 10 — say the same about finding long-term care providers who can prepare the kind of food they are used to. Some have concerns about finding nursing homes and assisted-living facilities that will respect their religious or spiritual beliefs, though fewer have the same concern about home health aides. Torres said he's not confident he'll find a culturally sensitive nursing home when he's gets older. "I'd rather just live alone and poison myself by accident rather than stay in one of those homes right now," he said. Like other older Americans, many Hispanics age 40 and older expect to rely on government programs like Social Security, Medicare and Medicaid to pay for long-term care services, even though Medicare does not cover most nursing care or home health aides. But only about 2 in 10 think any of these programs will still be providing at least the same level of benefits five years from now. Just 15 percent of older Hispanics are very confident they will be able to pay for their own future long-term care needs. The survey also finds that a large majority of older Hispanics are open to using at least one type of telemedicine to receive care, including phone consultations, text messages or video services like Skype, although older Hispanics are somewhat less likely than others in their age group to say they'd be comfortable using some types of telemedicine. Gabriel Vargas, 41, of Lancaster, South Carolina, who is from Veracruz, Mexico, said he felt these resources in his area already were helping Latino residents. The growth of online options, he said, is breaking down the stigma held by Hispanics around regular checkups and preventative care. "There's a nonprofit group here that goes out of its way to help," said Vargas, whose first language is Spanish. "Maybe 10 years ago, it was tough. But today I think it's become easier."